According to Marilyn Monroe, there a ''girl's best friend,'' Elizabeth Taylor was a firm believer that ''big girls need'' them. whilst Mary Frances Gerety said they were ''forever.'' We're talking diamonds, of course. Over the last 80 years or so, no other gemstone has played such a central role in popular culture as diamonds. From engagement rings to anniversary presents to saying ''I'm sorry'', diamond jewelry today is among the top-selling types of jewelry in the world. How did diamonds become so popular? For centuries, diamonds had served as a symbol of wealth and superiority since they started being traded sometime around the 1400s. 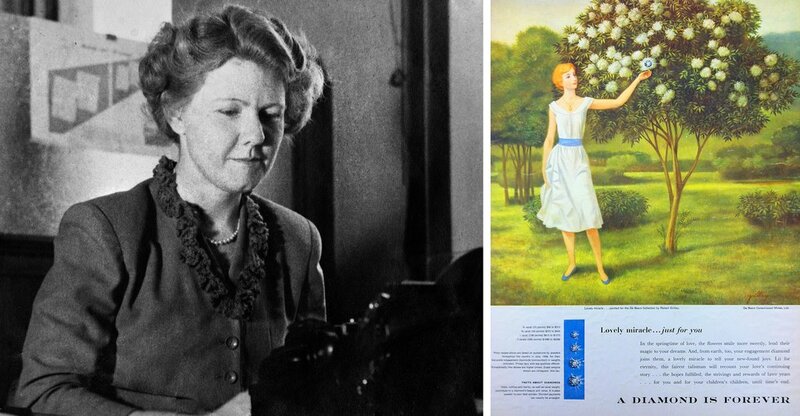 It wasn’t until the mid-1930s that the gem became synonymous with love and marriage. Interestingly, the modern day association between diamonds and love started just as the United States was starting to recover from the Great Depression. Perhaps unsurprisingly, diamond sales (and jewelry with diamonds) had taken a massive hit in the late 1920s and early 1930s, as people simply couldn’t afford luxuries. Today, the diamond market is worth approximately $65 - $70 billion globally, but in 1939 wholesale sales of diamonds barely topped $20 million. In 1938 De Beers, the international company that held a monopoly on diamond production and supply, decided it was time to advertise in order to increase sales. However, research conducted by its ad agency found that diamonds were mainly perceived to be something reserved only for the ultra-rich. The ad agency had a lot of work to do in order to appeal to mass consumers. It wasn’t until the late 1940s that De Beers and their ad agency alighted on the most famous of phrases, and the campaign that would have such a deep impact on our culture’s perception of diamonds. However, Gerety's famous line almost didn't make it. Mary Frances Gerety, a young copywriter, came up with the line late one night as she scrambled to come up with a tag line. The ''A diamond is forever'' line failed to elicit a reaction in the pitch meeting, it wound up on an ad depicting a young couple on their honeymoon. Coupled with a campaign to get Hollywood celebrities to always wear diamond jewelry, the line became De Beers' official motto for approximately 50 years. Over the next 30 years, diamond sales in the U.S. increased to $2.1 billion, making the campaign one of the most successful in modern advertising history. In fact, the ''A diamond is forever'' slogan was named the ''Slogan of the Century'' by Advertising Age, the main publication of the advertising industry. After a brief hiatus from its ads in 2008, De Beers rebooted the slogan in 2015. 8.41 karat internally flawless fancy vivid pink diamond at Sotheby's in Hong Kong on October 7, 2014. 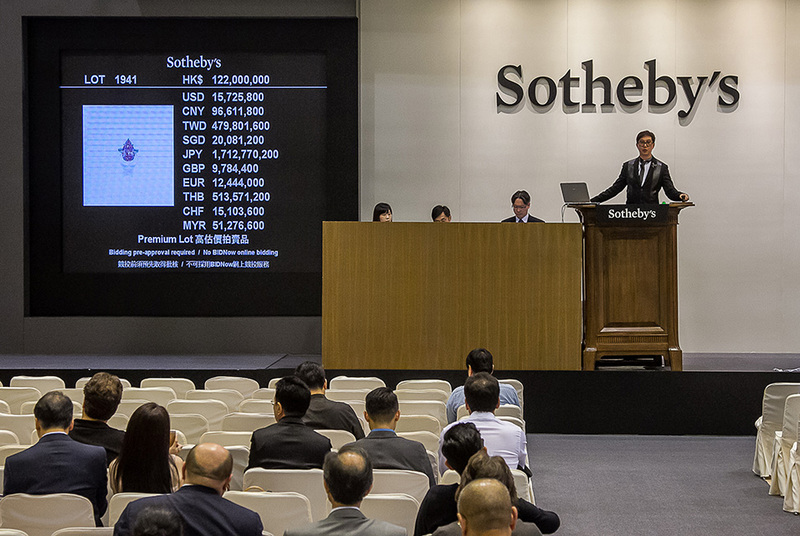 The diamond sold for at the time a record HKD 137.88 million (USD 17.77 million) AFP PHOTO / SOTHEBY'S HONG KONG. Today, approximately 26,000 kg of diamonds are mined annually, while approximately 100,000 kg are synthesized. Synthesized diamonds are manufactured in a laboratory using chemical processes. A combination of political and human rights issues related to mining and increasing industrial demands for diamonds has greatly driven the use of synthetic diamonds, but they are often widely considered to be of equal or near equal quality to mined, refined diamonds. In 2016, De Beers’ CEO announced that the world diamond supply was set to peak last year, due to increasing extraction costs. Real diamonds, whether new or those found in jewelry made prior to the invention of diamond synthesis, are even greater in value today than ever. In short, diamonds remain in high demand in the U.S. and elsewhere. And while the diamond engagement ring still drives sales, today’s trends indicate that women are now more likely than ever to buy their own diamond jewelry, and that married women are more likely to buy diamond jewelry for themselves than single women. That said, the 2017 Global Diamond Industry Report forecast that demand for diamond jewelry will decline this year. However, for collectors and jewelers alike, these trends suggest any pieces bought today—be they new or antique—will only grow in value over time, making them an excellent investment today. Search more diamonds on Barnebys here.